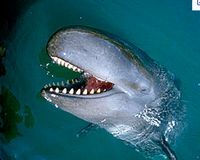 ADD FALSE KILLER WHALES TO ENDANGERED SPECIES LIST ! PLEASE TAKE ACTION ! ! These whales face a number of serious potential threats to their survival, including: injury and death from unregulated fishing practices, depletion of their prey and exposure to toxic chemicals. Thanks for posting Cher. Already signed. Thanks, Cher! Signed and noted! Goodness, can't get the page....BLANK!